Synopsis: Small-time criminal Harry (Michael Brennan) has been tipped off to a potential big score, far bigger than anything he's ever been involved in. A half a million pounds' worth of cut diamonds are due to be shipped across London by a boutique jeweler as part of a commission. 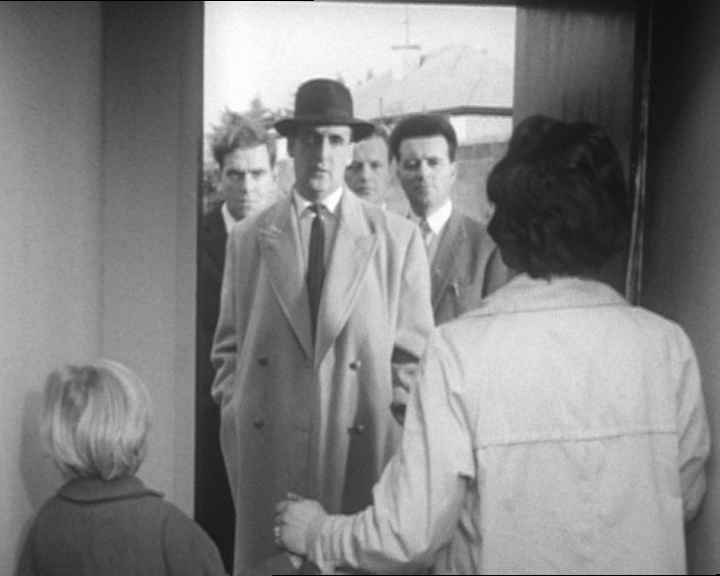 Harry teams up with old cronies Nimmo (Bruce Seton) and Danny (Lawrence Crain), and outside man Kegs (Norman Rodway). 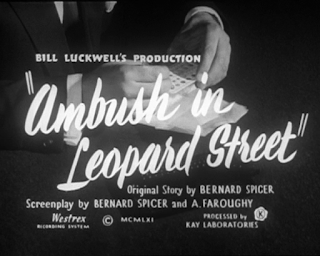 Together they draw up a plan to ambush the van carrying the diamonds at its most vulnerable point -- while it's on the narrow, secluded Leopard Street. Harry knows the cargo and he knows the route. The only thing he doesn't know is exactly when the shipment will be moved. In order to find out, Harry recruits his brother-in-law Johnny, a good-looking kid with an insouciant charm and a clean record. Harry plans to arrange a chance meeting between Johnny and Jean (Jean Harvey), a lonely secretary who works for the jeweler. Johnny's task is to start up a romance, and get her to spill the beans about the date of the shipment. Harry's wife Cath is angry at him for dragging her kid brother into his seedy business, but Harry insists that the payoff will be enough to set the kid up for whatever in life he wants to do. Anyway, he promises, this is his last job. Johnny is successful in winning over the romantically gun-shy Jean, but as the two grow closer he begins to have second thoughts. Is he really starting to fall for her? And if so, can he go through with the deception? 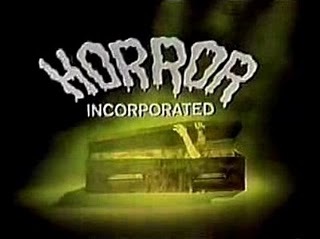 Comments: Ambush In Leopard Street isn't the first crime drama to be broadcast on Horror Incorporated, but the ones that we've seen so far (like The Island Monster or The Face Behind the Mask) at least feature a recognizable horror star. Tonight we have a low-budget British heist picture, with no stars at all. I'm sorry to report there are no leopards in it either. Giving the film a fair assessment isn't easy; the only extant version seems to be a 57-minute DVD release from Renown -- 16 minutes shorter than the original theatrical cut. I suspect that's why the plot seems as choppy as it does. But I don't need the extra 16 minutes to tell you that the plot is simple - perhaps too simple - and director J. Henry Piperno fails to provide even the slightest spark of visual interest. 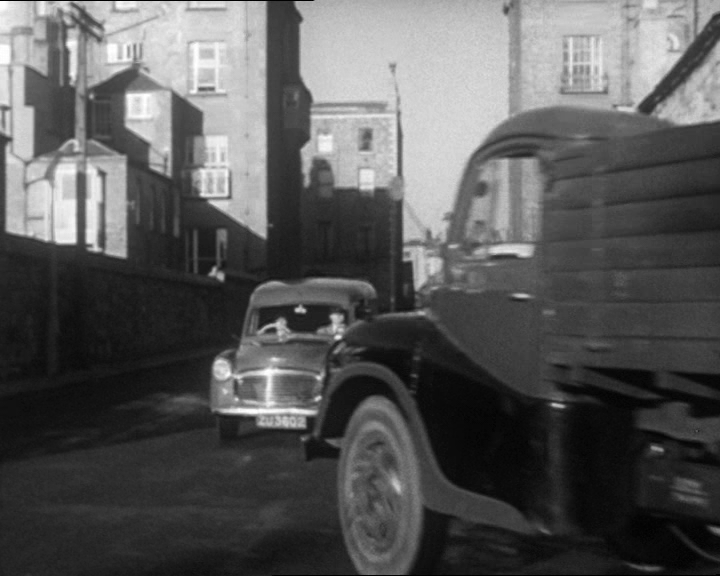 The interior sets are dingy and uninteresting with only the most rudimentary lighting; and the frame compositions are pedestrian and unimaginative. In Piperno's favor, the focus on small-time London hoods has real potential, and the actors are generally doughy and unattractive -- that is to say, they look like real people, not movie stars. On top of this, the street scenes (actually shot in Ireland) lend credibility to this story about the criminal bottom-feeders in London's rougher quarters. In the hands of a more talented director Ambush In Leopard Street might have been a raw, documentary-like thriller, but the movie tries to follow the template of better-known heist pictures of the 1950s. There's just not enough suspense to make it work. As a result it comes off as plodding and dull. There are also a number of plot holes that dog the movie from the start. There's no real reason to think Harry's plan should work, since it hinges on a number of factors he can't control: that Jean knows the precise timing of the shipment, that a novice con man like Johnny will be able to wheedle the information out of her, that the van wouldn't take an alternate route or change the schedule at the last moment. For that matter, sending two guys in a van seems an extremely risky way to carry what would be equivalent today to $9.6 million in diamonds. 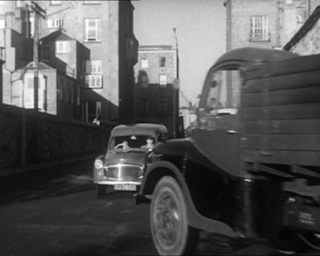 It seems likely that, even in 1962, the shipment would be outsourced to couriers in an armored car. This was a rare starring role for Michael Brennan, an extremely prolific actor who usually played thugs and bartenders. He was in Thunderball and played a club fighter in "The Girl Who Was Death", an episode of TV's The Prisoner. Synopsis: Guy Thornton (Dermot Walsh) and his wife Margaret (Hazel Court) have recently returned to England after a few years of living in the U.S.A. Guy was in the Canadian navy during the war and the two have the idea of buying a yacht and using it as their home. 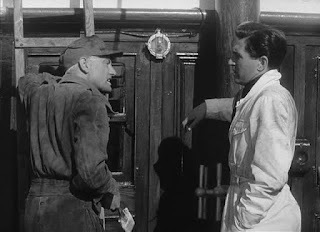 They see an advertisement for a diesel ship called the Cyclops; upon looking at the ship Guy can see that while it's long been neglected, under all the grime and the peeling paint is a beautiful yacht -- exactly what the couple has been looking for. The dealer seems reluctant to sell, though, telling the couple a strange story that he wants them to consider before purchasing. The Cyclops had been owned by a married couple, the Martineaus, who one day drew the ship out from her berth -- the very berth she is resting in now, the dealer says -- and set out on a pleasure cruise in the English Channel. With them was the ship's engineer, a very capable man. Some weeks later the Cyclops was discovered, drifting and abandoned. She was found to have absolutely nothing wrong with her. The three people on board had simply vanished. After an inquest the ship was put up for sale. The new owners became alarmed by many odd things happening on board - a persistent smell of cigar smoke, even though no one on board smoked them; and the ghost of a man that sometimes appeared in the engine room. The owners put the ship up for sale, but the Cyclops' reputation as a haunted vessel has dogged her since. 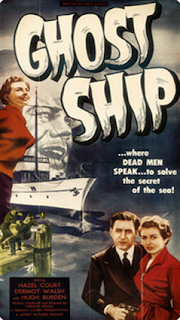 Comments: Not to be confused with the 1943 Val Lewton film of the same name, Ghost Ship isn't a movie that goes for outright scares, but instead cultivates a growing sense of unease. As horror movies go, it's fairly low-intensity. And given the film's provenance this shouldn't come as a surprise. 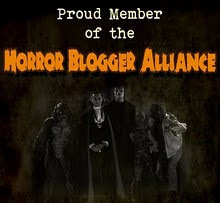 British horror in the pre-Hammer days tended to be quite understated, and this film is no exception. It's a ghost story in the classic sense, one that deftly frames the central mystery of the Cyclops: what happened to the Martineaus and their engineer? As in many haunted-house stories the couple reaches a crisis point when they realize they were wrong to scoff at the ghost stories (horror films always exact a penalty to scoffers) but find they are trapped. They have sunk all their money into buying and renovating the ship. They can't flee the Cyclops and must find a way to rid her of the ghostly infestation. Margaret, who is the more open-minded of the two, confesses to Guy that she has called in an expert from a psychic research organization to assist them. Guy is unhappy about this at first, certain that he's opening their home to a crackpot or a con artist, but finally relents. "What have we got to lose?" he says. "Ten pounds," Margaret replies. "That's their fee." Expecting a colorful charlatan, the Thorntons are surprised to meet Dr. Fawcett, an earnest parapsychologist armed with nothing more exotic than a box full of tuning forks, which he uses to demonstrate the way in which sound waves pass through air and other media, such as water. It's the same, Fawcett says, with psychic vibrations. It's a rather long scene and no film would risk boring the audience with anything like it today, but there's a charm and innocence to it that I found appealing. The beautiful Hazel Court appeared a number of horror films, most notably Hammer's The Curse of Frankenstein in 1957, Corman's Masque of the Red Death, The Raven and The Premature Burial in the early 1960s. To me, however, her most impressive credit is her appearance as Ellen in the completely unhinged Devil Girl From Mars. Dermot Walsh, like his fellow castmembers, was a bread-and-butter actor who could easily jump between lead and supporting roles, and seems to have done a fair amount of stage work in his long career. 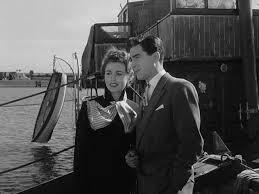 But the real star of the movie is the Cyclops, the beautiful steam yacht at the center of the story. Unsurprisingly, the yacht was owned by writer and director Vernon Sewell. Looks like the clever Mr. Sewell was able to write off some maintenance work on the ship out of the film's budget. And why not? Two British titles I've never seen. Dermot Walsh and Hazel Court were in reality husband and wife, as daughter Sally played her mother's Elizabeth character in THE CURSE OF FRANKENSTEIN as a child.